"Mary Heebner's Hamlet: Book of Dreams "
The alchemy of poetry and painting has always been close to the core of Mary Heebner’s art. While her two books incorporating visual art with the poetry of Pablo Neruda, On the Blue Shore of Silence and Intimacies, are perhaps her best-known efforts, her recent adaptation of William Shakespeare’s Hamlet may be the most glorious manifestation yet of her affinity for text. Encased in a gorgeous clamshell box created by John Balkwill of the Lumino Press in Santa Barbara, who also printed all the text, this very limited edition contains 20 direct-pigment prints taken from a series of collage paintings based on the artist’s personal response to Shakespeare’s most famous play. With the visionary splendor and painstaking attention to detail of a latter-day William Blake, Heebner has achieved something very remarkable with this project. The individual prints are all in the form of triptychs, with more brightly colored, generally figurative panels at left and right flanking a central, darker image. An initial aesthetic pleasure in the artist’s palette and line provides the foundation for a progressively more nuanced reading of the artwork. For instance, “Folio #7” is keyed to a bawdy exchange between Hamlet and Rosencrantz and Guildenstern. The question that Hamlet asks — “My excellent good friends! How dost thou, Guildenstern? Ah, Rosencrantz. … Then you live about her waist, or in the middle of her favors?” — refers to Dame Fortune, and not a real woman, but Heebner chooses to obscure that fact and the female figure’s face, leaving the anatomical details but depriving the viewer of a certain identification. Fortune becomes a cipher for the other women in Hamlet, as Heebner’s treatment expresses a healthy revisionist impulse toward the play’s often mischievously chauvinistic tone. 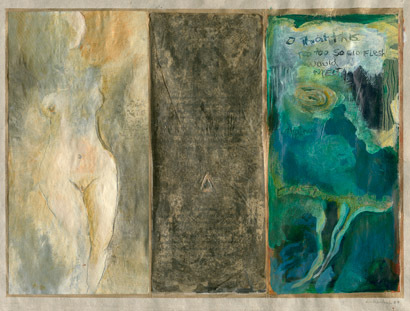 In an “Artist’s Note” attached to the package, she acknowledges this tendency to reevaluate Gertrude and Ophelia, identifying them as reflecting “the play’s conflicts and emotional energy.” Every aspect of this project, from the distinctive design and luscious materials to the delicate personal watermarks found throughout, registers the intelligence and wisdom of an artist operating at the height of her powers. It’s a pleasure to see the words of a great writer awakening such a sophisticated and heartfelt response across so many centuries and in a medium not traditionally associated with drama.